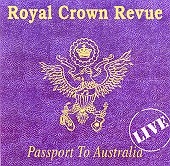 In Music We Trust - Royal Crown Revue: Passport To Australia - LIVE! Los Angeles swingsters Royal Crown Revue saw a rise in popularity, as swing became a mainstream music style in the late 90's. However, they were doing it way before it became popular to do so, and, as Passport To Australia attests to, they're doing it well after MTV deemed it cool to be into swing. On their second live album, the band delivers a few live versions of songs off of their post Caught in the Act (the last live album) albums: 1999's Walk On Fire ("Watts Local" and "She Walks On Fire") and 1998's The Contender ("Stormy Weather"). They also deliver several covers and traditional swing pieces to get you cats dancing. Front man Eddie Nichols leads RCR through slow, simmering numbers such as "Bye Bye Blackbird" and "Fever". Jumpin' classics like "Bim Bam" and "Jam Up". And they do a darn good job of getting you sweating on the vigorously sweet "Rock That Boogie," a rockabilly-swing boogie that will make you hot. Royal Crown Revue's fire is in full force on the Latin-groove-turned-cocktail-jazz of "She Walks on Fire", and things devilish on the blues-tingled rough swing of "Lonesome Tears". RCR creates lively, entertaining, and passionate performance song after song, giving swing fans something to dance too, and giving the casual listener an anything-but-smooth collection of swing that never grows old. I'll give this an A-.